All contact lenses will develop surface deposits if they are not regularly polished. 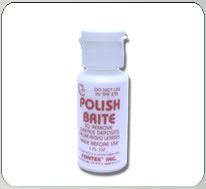 Contex’s unique Polish Brite formula cleans and polishes hard and gas-permeable contact lenses. Used at least weekly, Polish Brite can remove and prevent many types of surface deposits, including hard to remove protein deposits. Polish Brite also removes light scratches. Contex’s high quality standards and innovative formulas have provided "Clean comfortable" lenses for thousands of patients for over 20 years. 5. Gently clean the inside, outside, and edges in your palm using your fingers. 9. Clean and Soak the lenses for at least 6 hours in Clear Clean before use. Note: If lenses fog or feel dry, dirty or uncomfortable, Clean and soak the lenses in Clear Clean for up to 24 hours. If the problem persists, professional polishing may be necessary. Cosmetic additives or oil-based products cannot be removed except with professional laboratory polishing. Warning: Polish Brite is not to be used directly in the eye! To avoid contamination of this product, do not touch tip of container to any surface. Replace cap after using. If solution drys out or changes color, do not use. If you experience eye pain, changes in vision, redness or irritation of the eye, consult a physician. Keep this and all medicines out of the reach of children.